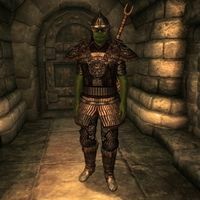 Adventurers are Orc NPCs who are found randomly in a range of ruins, forts and caves throughout Cyrodiil. They will always be named "Adventurer." They have been sent out by Gortwog to seek treasure for the glory of Orsinium. Each Adventurer will be 2 levels lower than the player, and can be a Warrior (4 in 6 chance), Spellsword or Battlemage. They are friendly to the player and are typically found sleeping, eating and searching their current location for treasure. They will attack creatures they encounter in the dungeon, and may also loot chests and pick up items they find laying around. As such, if you are coming across empty chests or can't find items that should be in the dungeon, check to see if there is an Adventurer in your location who is carrying the missing treasure. All adventurers wear leveled armor: boots, cuirass, greaves and helm; warriors additionally have a shield. Adventurers all carry an enchanted, leveled weapon. About one time in four, an adventurer will possess something from the following list. Common Ingredients 3.6% One of Alkanet Flower, Arrowroot, Bonemeal, Ginkgo Leaf, Ginseng, Garlic, Flour, Leek, Mandrake Root, Rat Meat, Rice, Root Pulp, Tobacco, Wheat Grain. Rare Ingredients 3.6% One of Bloodgrass, Dragon's Tongue, Glow Dust, Harrada, Redwort Flower. Common Ingredients 7.1% Same list as above. Leveled Gems 1.4% Anything from flawed pearls up to flawless diamonds. May also have silver or gold nuggets. Leveled Jewelry 3.6% Anything from a bronze amulet up to an ebony diamond ring. "You too seek wealth, do you not? May you find it, and may tales of your journey be legendary." "Well met, traveler. Are you seeking treasure as well? Gortwog demands riches, so all of Tamriel will respect Orsinium." "So we search the lands and bring home whatever we find. This makes Gortwog happy." "I must return to my task, for Gortwog waits. May you find all that you seek, traveler." Books in the game provide some background on Orsinium and Gortwog. How Orsinium Passed to the Orcs tells how a few years ago (3E 399) Gortwog gro-Nagorm came to be king of Orsinium and warlord of the Orcs (this also happens to be a heavy armor skill book). Also, several books mention the much earlier siege of Orsinium (1E 950 to 1E 980) when the orcs had previously been driven out of Orsinium. The names Orsinium and Gortwog may also be familiar to players of Daggerfall, where they appeared in several quests (Dust of Restful Death, Barenziah's Book, and Orcish Treaty). Killing an Adventurer counts as murder unless you are in sneak mode and nobody sees you (even the Adventurer himself). This murder will trigger the Dark Brotherhood quest line if it is your first murder. However, there is no bounty for murdering an Adventurer in a dungeon. Esta página foi modificada pela última vez à(s) 01h29min de 14 de fevereiro de 2015.